From the sessions that brought you Drums Between the Bells comes more frustratingly aloof music and poetry from Eno and Holland. Earlier this year, Brian Eno set out to adapt the thickly veiled poetry of Rick Holland to his own signature style of ambient electronica with the full length album Drums Between the Bells. 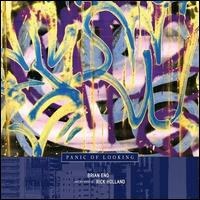 Four months later comes this follow-up EP, Panic of Looking, showing off the same arcane package of circumstantial synthesizer jitters banging against a bunch of I-get-this-poem-and-you-don't kind of prose. And what's more distracting are the tracks featuring vocalists Anastasia Afonina and Bronaugh Gallagher, existing to make a novelty of their hard "R" accents. The one poem that makes a connection between metaphor and the tangible is "If These Footsteps", with its points of interest that "fade out somewhere in the mixing desk" in just one minute. There is also an instrumental track, leading me to think that perhaps Holland gave Eno just the title: "Watch a Single Swallow in a Thermal Sky, and Try to Fit Its Motion, or Figure Why It Flies." Good luck with that.